Kozmo Casino is an online casino powered by NetEnt, IGT, NextGen Gaming, Thunderkick, owned by Cassava Enterprises and legally licensed in Gibraltar and United Kingdom. CURRENCIES: Euro and Pound Sterling. DEPOSIT METHODS: Bank Wire Transfer, MasterCard, Neteller, PayPal, paysafecard, Visa, Entropay and Pay by Phone. WITHDRAWAL METHODS: Bank Wire Transfer, MasterCard, Neteller, PayPal, paysafecard, Pay by Phone, Visa and Entropay. Posted by Lucy on June 4, 2018. Games allowed: Fluffy Favourites slot. Posted by teodorTMS on January 24, 2019. 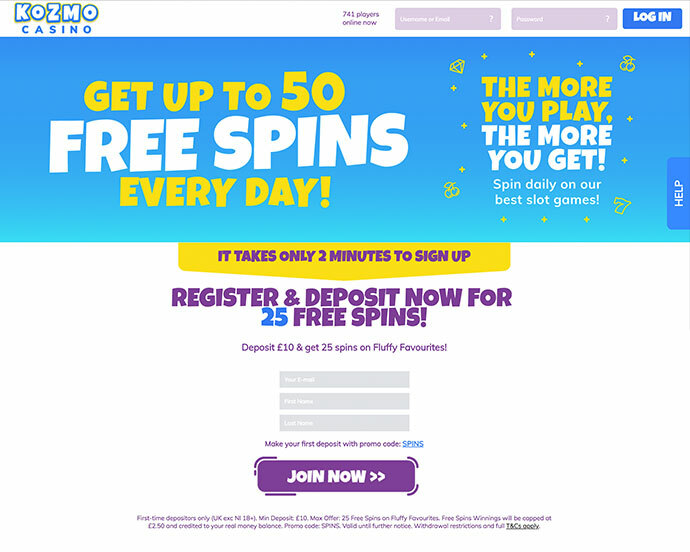 First-time depositors only (18+ UK exc NI). Min Deposit is £10. Max Reward is 25 Spins on Secrets of Shanghai using promo code: EAST or 25 Spins on Wild Saloon using promo code: WEST. Promo code can be used once during promotional period. Deposit balance is available for withdrawal at any time. General withdrawal restrictions & full T&Cs apply. Valid until 31.03.2019.